7.88" x 800 ft Size. 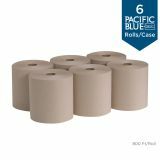 Fits into a wide range of everyday universal dispensers. 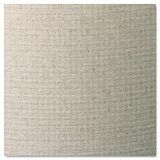 EPA compliant for minimum post-consumer waste recycled fiber content. 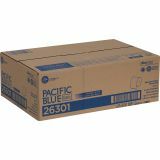 Georgia Pacific Professional Pacific Blue Basic Nonperforated Paper Towels, 7 7/8 x 800 ft, 1-Ply, Brown, 6 Rolls/Carton - High-capacity, roll towels offer reliable performance for environmentally concerned customers. 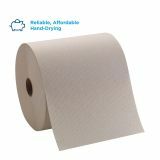 Ideal for washrooms in government and public facilities, office buildings, foodservice facilities and lodging. 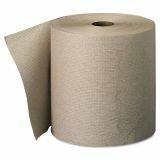 Economical, Envision 800' rolls offer an affordable choice for high-traffic areas. 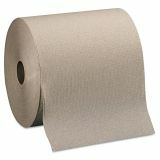 Hardwound rolls fit into a wide range of everyday dispensers. 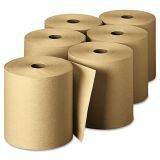 This product meets Green Seal™ Standard GS-1 based on chlorine free processing, energy and water efficiency, and content of 100% recovered material, with a minimum of 50% post -consumer material. GreenSeal.org. Towels are EPA compliant for minimum post-consumer waste recycled fiber content. 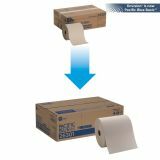 Each one-ply roll is nonperforated for easy tear-off from dispensers. Offers dependable absorbency, thickness, and strength. 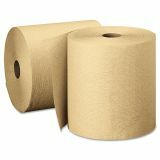 Economical 800-foot rolls offer a low per-unit cost make these towels an affordable choice for high-traffic areas.